In New York City, we often come in on the West Side of town and soon end up on the East Side. The quality and quantity of pizza in each neighborhood varies. Here’s the latest information. . . When we travel on Mega Bus, the bus presently stops near the Fashion Institute of Technology, at 28th Street and 7th Avenue. This is in the heart of the Garment District and just to the south of Penn Station. So, there are a lot of places to eat, to restore the strength after the ride from upstate. 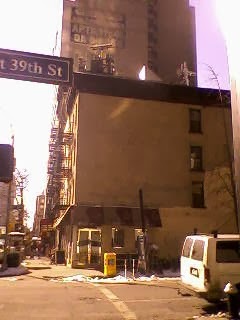 For example, if you want a reliable brand, there is a Panera’s in the block between 28th and 29th Streets. 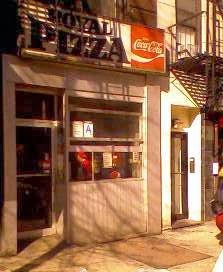 For pizza in this neighborhood, the best place I know so far is Rosa’s on the Long Island Railroad side of Penn Station. A person coming off the bus would walk north on 7th Avenue and head down the stairs or escalator to Penn Station. The slices at Rosa’s are large and not greasy. If you are going up to Times Square, the Sbarro Pizzerias are reliable, but they are a chain. 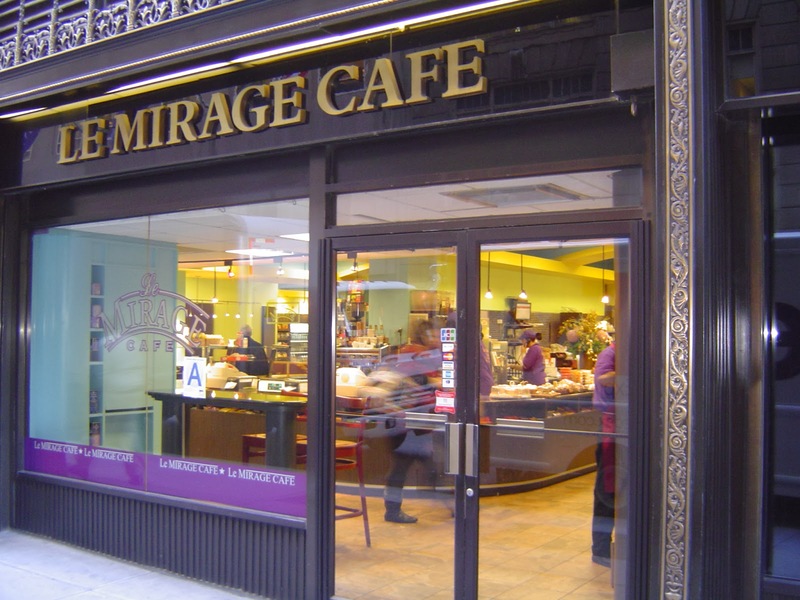 If you have the time, it’s worth heading the Le Mirage, on 43rd Street between 5th and 6th Avenues. On the East Side, I discovered a new pizza place, Royal Pizza, at Third Avenue and 39th Street. Royal Pizza offers a two-fer. In addition to having great pizza at a reasonable price - - they have seating in the back - - they are in an appealing older building, which appears to date to the mid-nineteenth century. It is eerie to be sitting in this pizzeria in a classic building, while just to the north almost every block has been transformed by the construction of sleek office towers. If you travel on the Hampton Jitney and like pizza, Royal is a great location to keep in mind. It’s only a block or two south of the Jitney stop on 40th Street. Presently, the restaurant on the corner by the Jitney is closed, which makes knowing about Royal an added benefit for hungry travelers. On our last few trips, we have left New York City on Mega Bus. All Mega Bus trips now depart from 34th Street between 11th and 12th Avenues - - across the Street from the Javitts Convention Center. Compared to Midtown or the East Side, this part of town has few food choices. The McDonalds on the corner of 34th and 10th Street, has a capable staff, lots of room and will get your food out quickly, if you are close to the deadline for lining up for the Mega Bus. The B&W Deli, two blocks east, at 373 West 34th Street, serves a good slice and has a few chairs for eating in. There is an appealing looking restaurant/deli called the Market Place, a block west of B&W. If I had not already grabbed two slices at B&W and was not pressed for time, I would have stopped in. There are sure to be more trips to the City, so stay tuned for more new food discoveries! If you are traveling through the City and find a good place, please send a post. It's always great to hear from readers!